Silver Spring, Md. 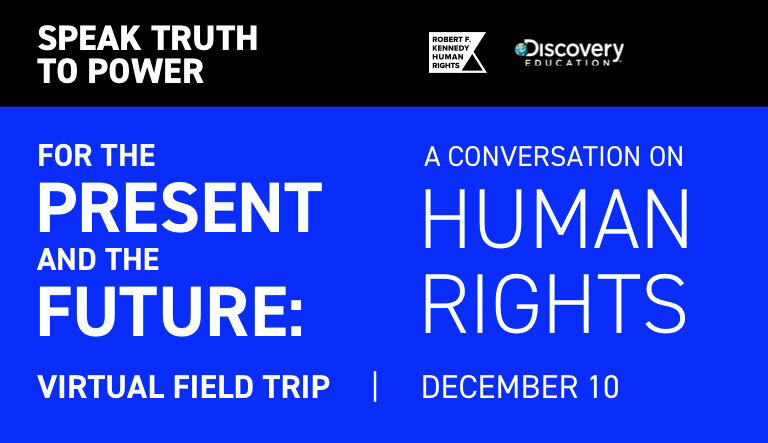 (Wednesday, December 5, 2018) – In celebration of Human Rights Day, Robert F. Kennedy Human Rights (RFK Human Rights) and Discovery Education, the leading provider of digital content and professional development for K-12 classrooms, today announced an inaugural Speak Truth to Power Virtual Field Trip entitled For the Present and the Future: A Conversation on Human Rights. Together, with host Kerry Kennedy, daughter of Robert F. Kennedy and president of RFK Human Rights, the immersive educational experience will showcase established and rising human rights defenders for an inspiring conversation about activism on Human Rights Day, Monday, December 10, 2018 at 1:00 p.m. ET/10:00 a.m. PT. During the immersion, middle and high school students will hear from defenders as they share inspiring stories and answer questions about what sparked their passion for activism and meaningful community involvement. Educators, parents, students and advocacy communities are invited to register for the Conversation on Human Rights here. Viewers are also encouraged to join @DiscoveryEd, @RFKHumanRights and other experts for a LIVE Twitter chat during the premiere of the Virtual Field Trip using #SpeakTruthtoPowerVFT. The immersive Virtual Field Trip experience will transport middle and high school students beyond the walls of their classrooms to explore why the Universal Declaration of Human Rights – ratified on December 10, 1948 – is as relevant today as it was 70 years ago. Speak Truth to Power in School offers immersive educational experiences and unique, multi-platform online learning tools, including: standards-aligned digital resources, video vignettes, an interactive map, biographies and thought-provoking classroom activities to tell the unforgettable stories of established human rights activists with the goal of helping students further explore pathways to become champions of justice in their own communities. RFK Human Rights’ collaboration with Discovery Education brings Speak Truth to Power to classrooms across the country with the goal of sparking a national dialogue about what it means to be a 21st century solution-seeker and human rights defender in our world today. RFK Human Rights is a Washington, D.C.-based non-profit organization that engages with young leaders from around the globe and is a leading source of human rights education for young people worldwide. To date, the organization’s efforts have impacted an estimated 5.2 million students, teachers, community leaders and citizens. Twenty-eighteen marks 50 years since Robert F. Kennedy’s run for President, and on December 12, 2018, Robert F. Kennedy Human Rights will host their 50th Anniversary Ripple of Hope Awards Dinner. The event will celebrate Robert F. Kennedy’s legacy and honor leaders from the international business, public service, media and activist communities who have demonstrated a commitment to social change. This year’s laureates include, David Zaslav, President and CEO, Discovery, 44th President of the United States Barack Obama, New Jersey Governor Phil Murphy and Bruce D. Broussard, CEO of Humana. Speak Truth to Power in School resources are available at no-cost at speaktruthtopowerinschool.com and are integrated into Discovery Education Streaming. For more information about Discovery Education’s digital content and professional development services, visit discoveryeducation.com. Stay connected with Discovery Education through social media on Facebook, Twitter, Instagram and Pinterest @DiscoveryEd.